UPDATE: Our website screenshots on the iPhone! As mentioned earlier today, mobile internet is on the rise. Estate agents need to make sure that their design company is keeping up to date with the latest industry changes. 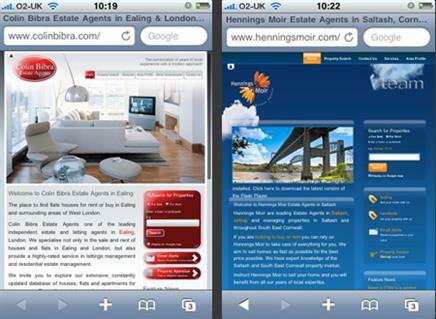 Below is a range of screenshots from three of our websites including www.henningsmoir.com and www.colinbibra.com, www.bonetts.co.uk. 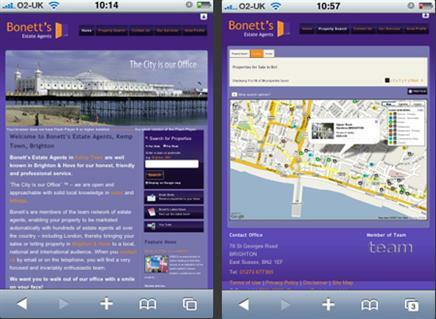 Users are able to search for properties and view the results on Google maps on their own mobile! As in the screenshot above, users are able to zoom in, and with the quality still excellent, users can choose local amenities such as schools, doctors and restaurants. Not only that, but our latest viewer technology, that is used by large companies such Sony and the BBC, is also able to seen in high quality. HIPS, EPCs, floorplans and PDF property particulars are all available within this website!